Going to college these days costs a pretty penny—and then some. But you may be able to defray some of the costs if you qualify for tax breaks such as the two tax credits for qualified higher education expenses or the tuition-and-fees deduction. The recent Protecting Americans from Tax Hikes (PATH) Act breathes new life into these tax breaks and may provide more options. 1. American Opportunity Tax Credit:The American Opportunity Tax Credit (AOTC), previously known as the Hope Scholarship credit, has been extended and modified several times. With the last extension, the AOTC was scheduled to expire after 2017, but now the uncertainty about this tax break has ended. Under the PATH Act, the enhanced AOTC is a permanent part of the tax code. The maximum annual credit is $2,500. Significantly, the AOTC is available for each qualified student in your family—so if you have two kids in school at the same time, for example, you may qualify for a maximum credit of $5,000. Also, thanks to another recent improvement, you can claim the AOTC for up to four years of study for each child. Previously, the credit was allowed for only two years. One complication here is that semesters often span two calendar years, beginning in the fall of one year and continuing through the spring of the next. Because the AOTC can be claimed in only four tax years, you have to pay special attention to timing on your tax return, which generally is based on a calendar year. Your ability to claim the AOTC is based on your modified adjusted gross income (MAGI). For 2016, the phase-out range is between $80,000 to $90,000 of MAGI for single filers and $160,000 to $180,000 for joint filers. Once you exceed the top limits, you can't claim the AOTC. 2. Lifetime Learning Credit: The Lifetime Learning Credit (LLC) features a maximum credit of $2,000 that is applied on a per-taxpayer basis—you can claim it only once, even if you have more than one student in college. Another potential drawback to the LLC is that it is phased out at income levels even lower than the AOTC. The phase-out range in 2016 is between $55,000 to $65,000 of MAGI for single filers and $111,000 to $131,000 for joint filers. For these reasons, the AOTC is usually more helpful than the LLC—and remember, you have to choose one or the other. 3. Tuition-and-fees deduction: Finally, you may be able to claim a deduction for tuition and related fees that you pay to a college for your dependent children. This deduction has expired and been extended numerous times in the past. The PATH Act preserves it again, but only through 2016, though it could be extended once more. On your 2016 tax return, you may claim a deduction of $4,000 or $2,000, depending on your MAGI for the year. For single filers, the $4,000 deduction is available for a MAGI up to $65,000 and $2,000 if you earn between $65,000 and $80,000. Similarly, joint filers can deduct $4,000 for a MAGI up to $130,000 and $2,000 if their MAGI is between $130,000 and $160,000. You can't take this deduction if you exceed the upper thresholds. Who can claim these tax breaks? 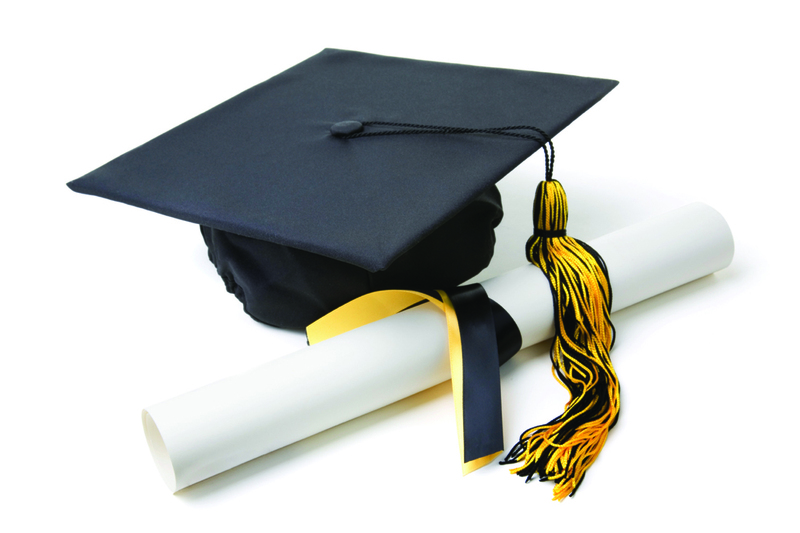 Generally, if parents pay college expenses and claim a student as a dependent on their tax return, they are eligible. However, in cases where the student isn't claimed as a dependent, he or she may be in line for the tax break. You may need professional tax advice to get this one right, especially if you're divorced. Which should you take—one of the credits or the deduction? It depends on your circumstances, but a credit, which reduces your tax bill dollar for dollar, is usually better than a deduction, whose value depends on your tax bracket. 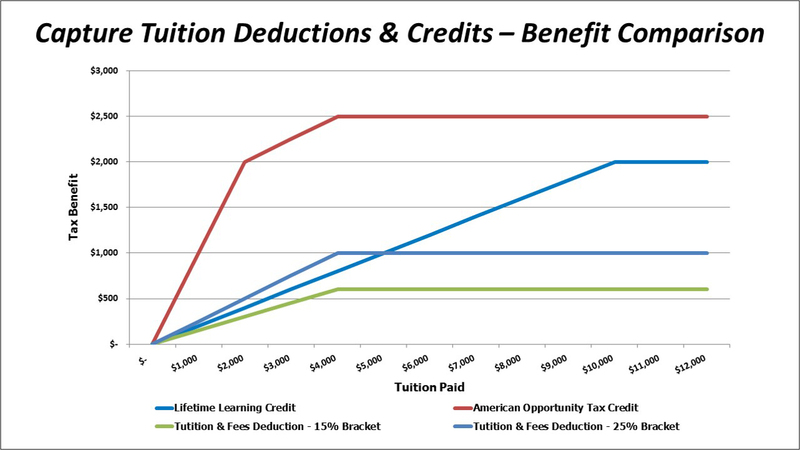 As shown in the attached chart, if you're in the 25% tax bracket, a $2,000 tuition-and-fees deduction is effectively worth $500. Compare that to a maximum AOTC credit of $2,500.